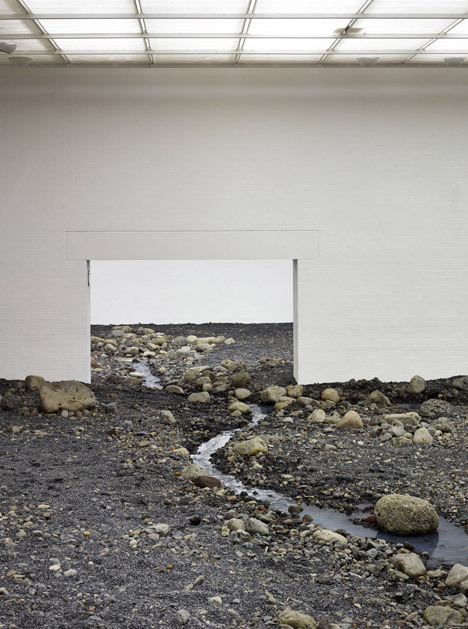 For his first solo exhibition at Denmark’s Louisiana Museum of Modern Art, Danish-Icelandic artist Olafur Eliasson has filled an entire wing with a landscape of stones meant to emulate a riverbed (+ slideshow). 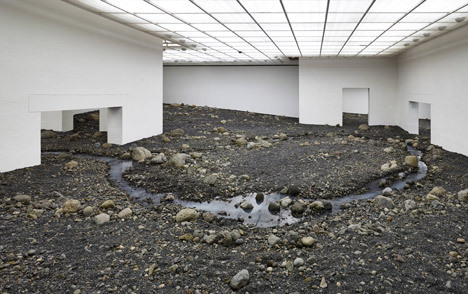 Described as a “stress-test of Louisiana’s physical capacity” the installation by Olafur Eliasson, part of an exhibition titled Riverbed, is a staged imitation of a natural landscape within the walls of one of Denmark’s important Modernist buildings. 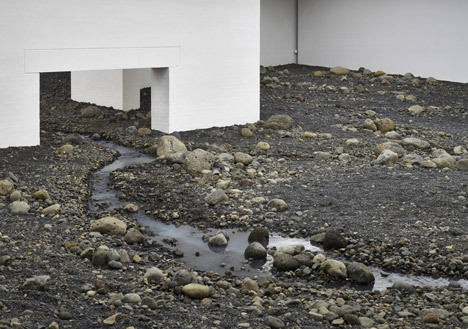 Occupying a site on the sea shore in Humlebæk, north of Copenhagen,Louisiana was originally designed in 1958 by architects Jørgen Bo and Wilhlem Wohlert and has since had seven extensions and alterations carried out by the same architects. 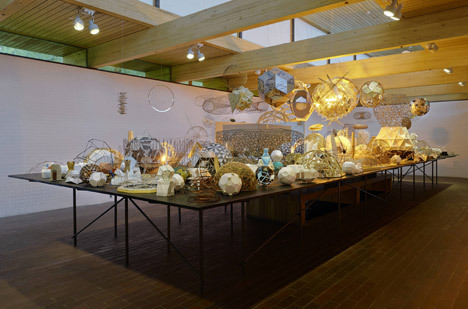 “Since the beginning of the collaboration it has been clear that a solo exhibition of Eliasson’s work at Louisiana would inevitably be a radical, site-specific exhibition dealing with the reality of the museum as an institution and physical locality,” said a statement from the museum. 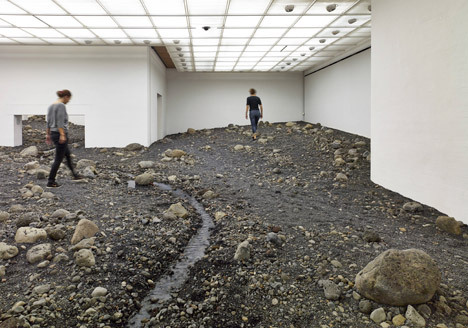 Visitors can walk on the rocky surface, which slopes up towards the sides of a series of rooms that make up the museum’s south wing. 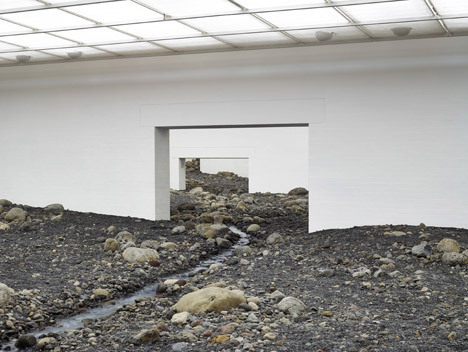 A narrow path running through the spaces has been filled with water to recreate the trickle at the bottom of a dried river. 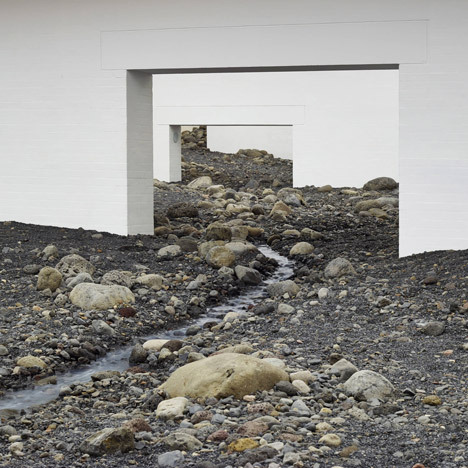 At the top of the south wing, a library has been created to house a collection of Eliasson’s art books – including a new publication produced for the exhibition featuring landscape photographs of Iceland from 1986 to 2013 – and digital screens to provide access to his online archive. Eliasson has also created a series of geometric models with Icelandic artist Einar Thorsteinn to add to his Model Room, which has been in progress since 2003 and will be hosted in the museum’s north wing during the exhibition. The building’s main hall will show three video works – a portrait of Berlin called Innen Stadt Aussen from 2010; an exploration of a Chinese garden in Suzhou through movements created by choreographer Steen Koerner titled Your Embodied Garden filmed in 2011; and Movement Microscope, a 2013 movie that follows a group of dancers in Eliasson’s own studio.